The "Arizona Stop" is a proposal to bring new bicycle laws to Arizona based on the highly successful Idaho Stop. 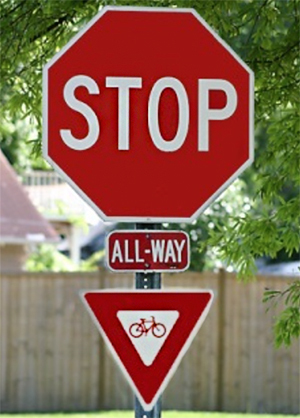 The Idaho Stop allows Bicycles to treat Stop lights as though they were stop Signs. Stop signs are treated like yield signs. These laws have actually increased Bicycle safety according to some reports and have never been shown to increase the danger. Meanwhile, the Idaho Stop encourages rapid transit by Bicycle while at the same time reducing frivolous tickets against bicyclists. Here's a great video about why states should adopt the "Idaho Stop"
The idea for the Arizona Stop comes from the original Idaho Stop. In 2005, then Legislator Doug Quelland introduced a bill to bring the Idaho Stop to Arizona. Representative Quelland would daily bike from North Phoenix to the Arizona Capital in downtown Phoenix. He is an avid cyclist and proponent of better cycling laws. Unfortunately, he was the only one of the 90 legislators that commuted on a bicycle. Most of the Legislators just didn't take an interest in or have an understanding of cycling issues. The Bill stalled in committee. In 2009 a similar bill was introduced as HB2479. It addressed stop signs but did not address stop lights. Additionally if an accident occured due to the bicyclist failing to yield, he would be at fault (this rule already exists for cars failing to yield). The bill failed in the Military Affairs and Public Safety Committee (MAPS) on a 3-5 vote. In 2010 the bill was reintroduced in the House with six legislators sponsoring it (HB2633), but it was held in committee and was not allowed to progress. (Committee Chairman can stop a bill from progressing). This year the requirement for treating stop signs as yield signs had the additional provision that the bicyclists must be at least 16 years old. In 2012 the same legislation was reintroduced as HB2211 and actually made it out of the Transportation Committee on a 6-2 vote, but stalled in the next committee (MAPS committtee). For 2020 we are attempting to get the Idaho Stop reintroduced as a bill in the Arizona legislature with support form individuals, bicycle shops and organizations. "Same Road - Same Law"
1. Bicycles only weigh about 30 pounds cars weigh over 4000 pounds. Pickup trucks weigh over 5000 pounds and are the most likely to "right-hook" a bicycle. 2. Bicycles do not have motors. 3. No one is afraid of being killed or injured by a bicycle crashing into their car. 5. Bicycles do not have the acceleration to be able to speed out of the way of danger. 6. Bicycles are allowed to ride on the sidewalk. Cars are not allowed on sidewalks. 7. You have to be at least 16 years old to drive a car. But a 3 year old can ride a bicycle.